The Cider House started as a love letter in physical (in exceptionally encompassing form) to the orchards that do and will cover the landscape of New York and the greater Northeast. From a terroir perspective, the abundance of wild and state-bred apples alone recommends NYS as the hard cider capital of the country. When thinking in terms of biologically-appropriate planning, trees as part of a northeastern farm come front and center. Over the past few years of intense Cider House start-up, we've allowed the visible role of Good Life Farm to fade to the back ground. Kite & String is now the name of our house cider, and we still strive towards using only our own apples. This goal is years away but in focus as the clearest way for us to express the power of a biodiverse organic farming system. Like those we collaborate with most closely- Redbyrd Orchard Cider, Eve's Cidery and Black Diamond Cider- we value the life that exists within the orchard and recognize its potential for ecological healing. The 2016 organic Goldrush crop on our Good Life Farm was the sole harvest for that year, and quite minimal it was. We shared the loss of harvest potential with many Finger Lakes farmers starting right off at Valentine’s Day. In mid-February 2016 we saw temperatures swing from the non-winter we’d been having at 50F to 5F in one night. At that moment, it was adieu to the peach crop in one great Valentine’s Day massacre. As we proceeded through that capricious winter we watched temperatures soar to record heights January thru March only to drop randomly (in February) and significantly in April and May during blossom and pollination. We lost 95% of our crop between those 2 extremes, and then followed a drawn-out drought which started with the extreme dry winter and lasted all the way to October. The resulting water stress on the trees was lessened by the absolute lack of a fruit crop, but we watched our potential for a ’16 vintage estate cider and fresh fruit sales trickle away into a dry creek of farm desperation. A bright spot shone through the doom and gloom of scary climate and unhinged nature with a very tiny yield of Goldrush persisting on our adolescent trees. Between the drought and loss of buds at bloom time, we were astounded to greet these nuggets of survival. And the resulting fruit! We recorded the highest brix (sugar content of fruit, indicating ripeness, alluding to growing practices and giving a sense of what final ABV can be after fermentation) we’ve ever seen in fruit coming into Kite & String- either from our own organic fruit or from fruit purchased at more established FLX orchards. This juice was a miracle of complex, largely tropical flavors at the outset- think pineapple explosion- and through primary fermentation only became more astoundingly celebratory. Garrett and Jimmy made the lovely decision to keep our 50 gallons of 2016 estate harvest (all our own fruit) separate, and to dive into the opportunity presented by this beloved and exquisite pressing in late October 2016. Goldrush 2016 made its way through a primary fermentation designed to maximize fruit quality, to experiment with a new yeast to maximize the single varietal character and to allow time for the choose-your-own-adventure of post-primary fermentation decision making. In March 2017, Goldrush went into secondary fermentation to become a methode champenoise (traditional method or champagne-style) with loose yeast through secondary fermentation to bring fine, mousse-like bubbles to final cider. And Goldrush ‘16 fermented slowly away to a final and delightful 11% ABV. We disgorged with our fine team of 5 staff in October 2017 after 7 months of second fermentation and lees aging. At the moment, we’ve got a tiny 22 cases (50 gallons) to share and savor. And thus, we release it here to you. Because of the absolute precious-ness of this cider, K&S Goldrush 2016 will only be available to you and our Valentine’s Dinner folks for ordering and tasting. This cider, like the Baldwin ’16 you all received in November 2017, is very much a wine-like cider in its alcohol content, fruit expression, production method. Goldrush will pair well with the gentlest of Emmentaler or Alpine-style cheeses (think nutty flavors and subtle acid like a good Swiss). You’ll see how we serve it… first, with little to overshadow it but enough of a pairing to further tantalize your palate. It’s a celebration, the champagne of cider to get a little fancy with! We’re so pleased to have this come out of 2016 and all its challenges and even more pleased to share it with you- our closest friends in cider. Interested in our 2016 estate cider 'Goldrush'? First cycle of Cider House staff training is complete! 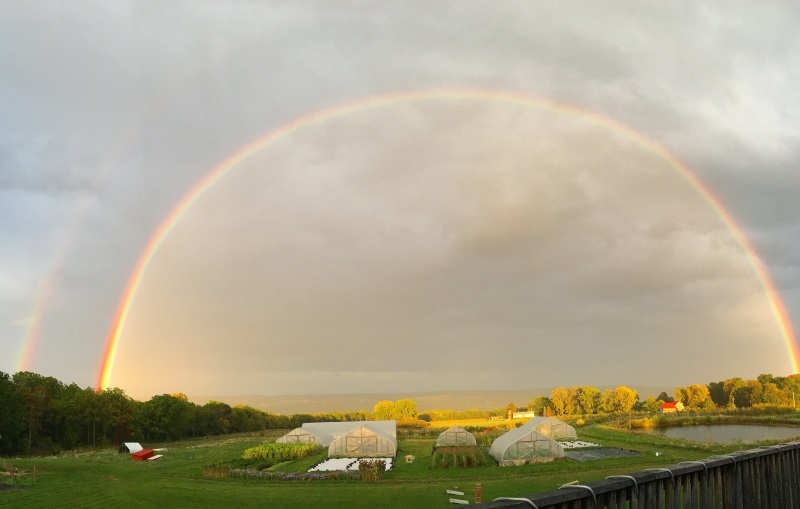 After starting our monthly tours with Eve's Cider in April and hitting Black Diamond in May and Redbyrd in June, we come home to the Cider House and the farm that is its foundation. Good Life Farm- a dream of building topsoil now in its tenth year. Home to Garrett and Melissa, who've been holding and implementing a regenerative design here for 10 years. Enter Matt and brother Jimmy, horses+dogs+cows+turkeys+geese and add, with the 2015 opening of the Cider House, 15 more human team members. Together we balance the long term ecological focus of the Good Life Farm with immediate economic reality. 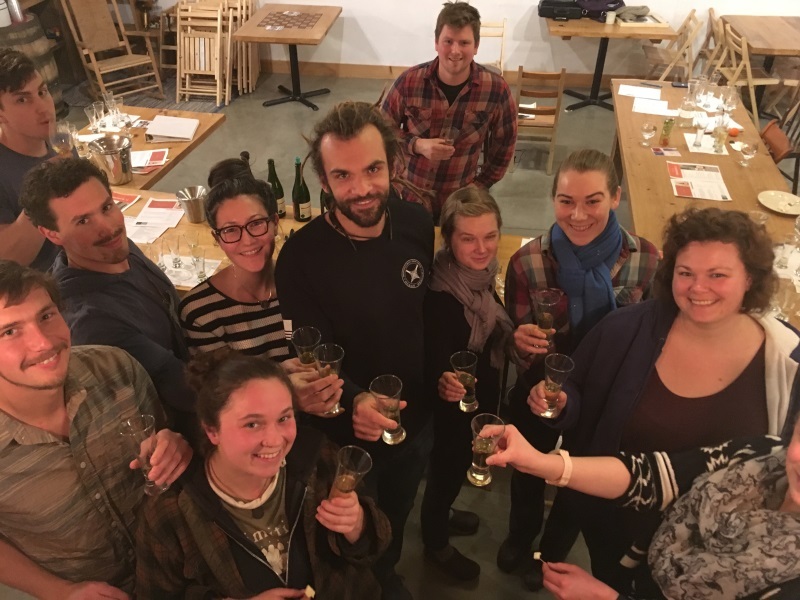 Good Life Farm is just coming into it's own- just barely- and the Cider House collaboration and our own Good Life/ Kite & String Cider production have made this leg of the journey that much sweeter. So we took this time to top off the longest party weekend if the year with a day-after gathering of our own to honor the Good Life Farm (Kite & String/Good Life Cider) and the entire Cider House team. In particular, we say goodbye to Brad, who brought a new level of integrity and intensity to the Tasting Bar but really, and also, employed his naturalist skills to bring us some forgotten apples from Hector for a new, soon to be released collaborative cider. Brad is off to new adventures, and maybe he'll someday tell us where those trees are. For now, we thank him for bolstering our young orchard with the fruit of these steady, survivalist elders. And sometimes at the end of all this heavy thinking, we just celebrate! Here's to the trees, here's to the teamwork that gets us there, whether we've been working together for a week or all this decade long. It happens so fast! Throughout March we watch spring plod towards us, hoping it won't come too fast and expose us all to late, killing frosts. Simultaneously, we are HUNGRY for it! The warmth! The absolute burst of life that is late April and May. One day you are sitting, covered in bees and thinking "oh, this is unique". And then you are covered in everything, and possibly underwater with your task list. And then it comes, very suddenly. And absolute all at once. Bloom begins in the peaches, spreads to the crabs and continues in perfect succession through the orchard. We are blessed at this point in the 2017 orchard season to see fruit in our future, as a deep balm to the huge losses of 2016. And we are challenged to keep up! 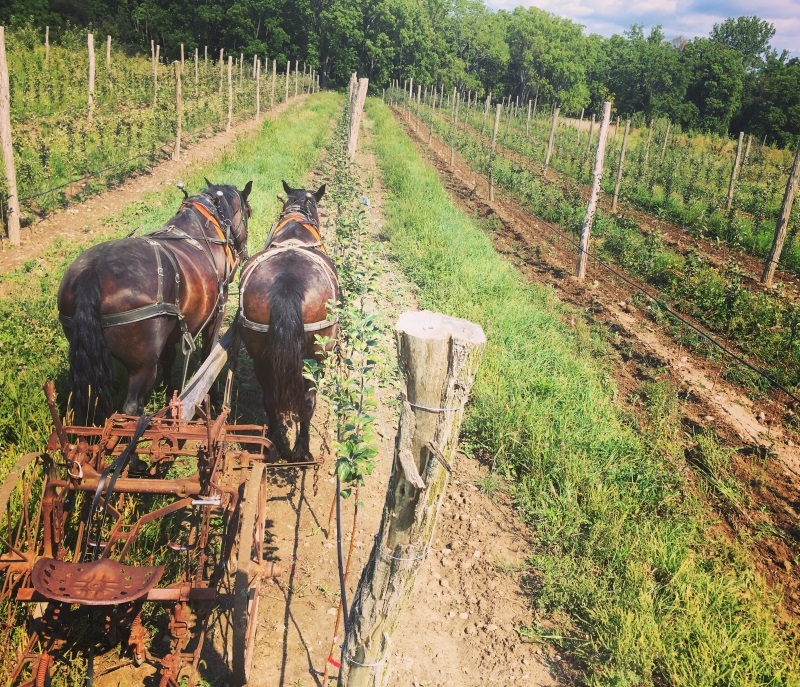 This past week we got through orchard set up and started planting our 1500+ dwarf orchard alongside and in between the past 8 years of long-lived, slow growing semi-dwarfs. We also chased cows around, and got them onto pasture! Huzzah- calving season can begin! Asparagus popped up, we'll be a-pickin' starting Saturday and every day til June! And always trying to take time to admire and appreciate this frantic, fleeting season.